During the broadcast they explained in detail the operation and procedures that Sunset World has implemented in order to protect and preserve the environment. The popular TV channel “Fox Business” through its “Innovations with Ed. Begley Jr.” show recently broadcast the great achievements in sustainability made by Sunset World Resorts & Vacation Experiences. During the broadcast they explained in detail the operation and procedures that Sunset World has implemented in order to protect and preserve the environment. 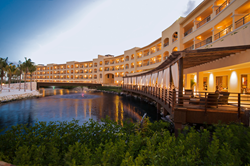 The show also highlighted the environmental practices undertaken by our flagship resort Hacienda Tres Ríos, which was planned from the ground up to limit its environmental impact. The resort was built off-site and then brought in to be assembled on top of concrete plates resting on more than 700 stilts. The elevated construction ensured the buildings did not touch the mangroves or interrupt the natural water flow that feeds and protects the local plants and animals. One of the big achievements emphasized was the fact that in Hacienda Tres Ríos, Sunset World provided both a luxury experience and a truly sustainable model – a difficult task in the past. The US TV show also described the Energy Efficiency Program implemented by Sunset World in its six resorts since 2014, with conclusive results such as 34 percent less electric energy consumption, which is like turning the six resorts off during four months every year; 32 percent less fossil fuel consumption, which is like keeping 100 cars off the roads for a year; and 32 precent less CO2 emission, which is equivalent to not cutting down 23,350 tress. With this broadcast the State of Quintana Roo maintains its position as an innovative and environment friendly world-class destination.